I have to admit, I've been avoiding the baking aisle for quite some time now. I find that desserts are one area where I can exhibit very little control. But the time has come, my lovelies, to revisit my old, dear friend: the cupcake. For the two of you who haven't been updated, my husband, Tim, has received a new job in Greenville, so he just left his position at Foothills Community Church. Being the homemaker I am (*giggle*sigh*self-realization*shame*back to blogging*), I knew that I should make something for the wonderful staff over at FCC. They have, after all, been so great to both of us and are being incredibly supportive during this transition. So after tossing around seven or eight ideas, my mother came to the rescue. It's like we're on the same wave length. We call each other at the same time, send each other emails at the same time, and the moment I desperately need a good dessert recipe, there she is. Apparently, these aren't new, but I am in love. 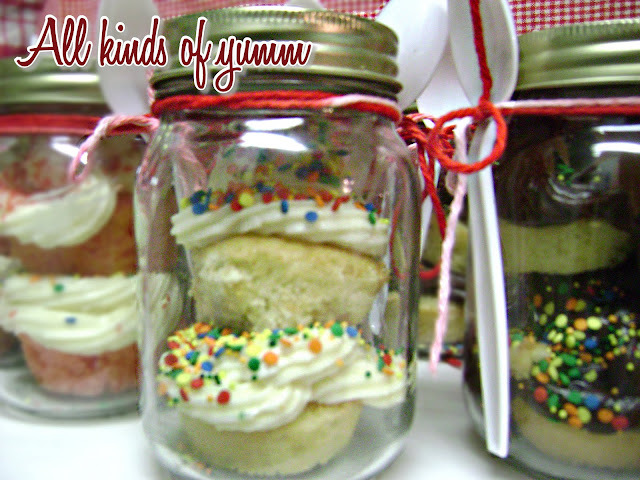 I love mason jars, and I love the idea of putting sweets into personalized containers. In my home, if they weren't personalized, there was a good chance someone else would eat your share. All's fair in love and dessert, right? Anyway, these can be made with any variety of cupcake recipes. I am doing two types: french vanilla cake with creamy chocolate frosting, and strawberry cupcakes with cream cheese frosting. Both winners in my book. Just be creative and have fun with these! P.S. Not to diminish the love and sincerity of these gifts, but for those of you who are unaware of this, mason jars are extremely inexpensive when bought at WalMart. I got a 12 pack for $6. Just sayin'. This is important! Normally when you make cupcakes, you fill them 3/4 of the way full. If you do that with these, they'll be too high for the jar, so go ahead and fill them only 1/2 of the way. I'd also suggest not using the paper containers and just putting the dough straight in the cupcake baking pan, well-greased. Remove from the heat and add the vanilla pod. Set aside. Beat the butter and sugar until well-combined and fluffy. You know the drill. Add the eggs and egg yolks, mixing after each one until well-combined. Combine flour, baking powder, salt and baking soda in a separate bowl. Cut open the vanilla pod and scrape the seeds into the buttermilk. If you want, you can always save the outside pod for vanilla sugar later on. Add 1/3 of the flour mixture until well-combined. Continue adding the flour mixture slowly. Combine the cake mix, gelatin, strawberries and juice, milk, oil and eggs in a large mixing bowl. Blend with an electric mixer on low speed until combined. Love you guys, but I'm not typing it all out again. Check out my previous blog that covers this recipe. Here's a warning: Do NOT use whipped cream as the top layer. I thought this would be a brilliant idea; however, it turns out whipped cream doesn't last more than about 20 minutes. Just splurge and make more frosting. That's it. Super simple, tasty and fun to make. And if we're being honest, they're pretty cheap. Another thing: we don't judge people here on this blog. If you don't have time to make these from scratch — as I know most of you don't — no one will be able to tell if you just grab the box mix. It also cuts down on the cost. Very Cute!!! Is it hard to get the cupcakes back out? Hi Rachel - love the jar concept. Aimee — it's really not hard at all. Just make sure you REALY spray the cupcake pan well so they're fully covered.